When Ridgescale Tusker enters the battlefield, put a +1/+1 counter on each other creature you control. I like Path of Discovery a lot, it's an underated card in my opinion. I'd like to play Krav but I don't know what to take out. 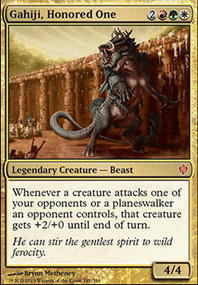 I already want to add Ridgescale Tusker, Verdurous Gearhulk, Scavenging Ooze and Inspiring Call with no idea what to take out. Pir, Imaginative Rascal: Like Hardened scales but for permanents. you could also add Toothy, Imaginary Friend since Pir can fetch toothy and Toothy can fetch Pir. Hadana's Climb Flip: Really nice win condition with it's flip card as well as extra ramp. Otherwise, it's an extra free +1/+1 counter each turn. Path of Discovery: Possibly puts a counter on creatures you control entering the battlefield. Can also serve as ramp and card filtering. 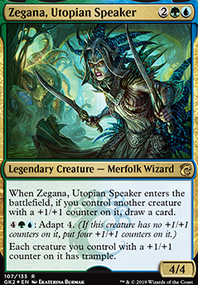 Generous Patron: First off, support 2 can target your opponents creatures, giving Kraj their activated abilities. Secondly, you'll draw two cards. Also, kraj can keep drawing you cards by giving enemy creatures you want the abilities of counters. Loyal Guardian: Constant buff for your creatures as long as you have Kraj. Marwyn, the Nurturer: Like Viridian Joiner, but it can get +1/+1 counters from a few of your creatures including Viridian Joiner. Nimbus Swimmer. Especially for Pir. Ridgescale Tusker since Loyal Guardian is better. 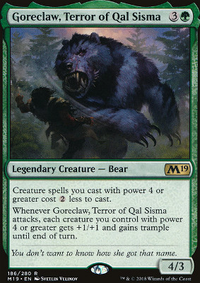 Some ideas from my wife's +1/+1 counter-themed Gaddock Teeg deck: Gavony Township, Oran-Rief, the Vastwood, Ridgescale Tusker, Sigarda, Host of Herons, Ainok Bond-Kin, Brave the Sands, Longshot Squad, Gyre Sage. Vulturous Zombie is a super fun card, but I'm not sure what you'd like to move around for it. 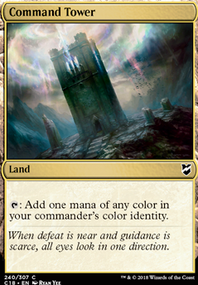 Probably a sideboard card, in the event you need to get over waves of tokens / are up against a lot of flying. Kalonian Hydra is an absolute must in this deck. Avatar of the Resolute is a perfect mid-to-late game card. Yes, while he costs merely , he's best played later on when your board is a bit bigger. Hardened Scales is a cheaper and harder-to-remove Corpsejack Menace, and Winding Constrictor is a cheaper version, albeit not as powerful, as well. 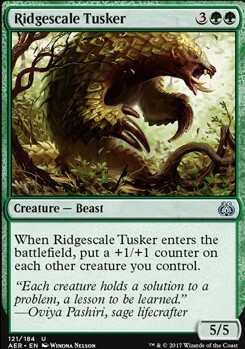 Ridgescale Tusker is a super fun card. I run it in my Selesnya Counters deck. Inspiring Call is perfect for full-swings and card advantage. Since it's an Instant, you can cast it during your opponent's turn and draw a ton of cards and not be forced into discard immediately as you only discard down to 7 during your own end step. Predator Ooze is just outright awesome. Ammit Eternal + Forced Adaptation is a nice way to reduce his -1/-1 counter loss and gives you a huge tank early on. Dragonscale Boon is a nice card, but I think it is redundant at this point. Ancestral Vengeance is actually kind of a nice black card for +1/+1 counters, though it may be inappropriate in this deck. It's really good to kill Indestructible creatures. You hit them for lethal, then 2nd main phase the AV onto them and they die to state-based-actions. But I'm not entirely sure how viable it is in a deck like this. There's a lot of changes which need to be made. First drop all the Primordial Wurms, switch them for Pelakka Wurm or more Aggressive Mammoth, not having trample on a six drop is so important. Also you need more land you should play at least 23 forest in a deck like this. Ditch Bitterbow Sharpshooters, Ridgescale Tusker, Wall of Vines and Wild Wanderer. There are much better drops at that slot. Take a look at some of the other mono green list in here and see what they are playing, they usually have budget alternatives to some more expensive cards, Vine Mare is a good example of this. Heya! 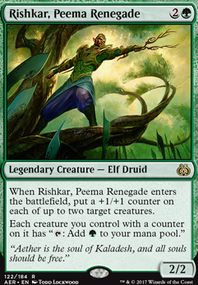 I like the deck idea overall, Temur is a great color combination, and Animar can be really explosive and fun. You already have some cards here that have +1/+1 counter synergy - I would say go all out with this prong of your strategy. Hardened Scales doubles the speed with which Animar builds counters, and helps all the other +1/+1 counter triggers get better. Longshot Squad, Sapphire Drake, and Tuskguard Captain/Crowned Ceratok give Animar (and anything else with a +1/+1 counter) Reach, Flying, and Trample respectively. Ridgescale Tusker enables your board by putting a +1/+1 on everything but himself, and accelerates Animar futher. Shaman of the Great Hunt might be good for some mid-game card draw, and helps spread the +1/+1 counters around. 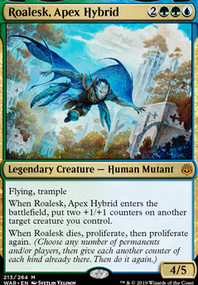 Creatures with Kickers and X in their CMC are also great choices, because they can really benefit from how big Animar's reduction can get. Some ideas are Grunn, the Lonely King, Altered Ego, Fungal Behemoth, and Verdeloth the Ancient.